Q: I have a 5-year-old Paint gelding who has been diagnosed with pedal osteitis. I have done what my veterinarian has suggested: lower his heels, use Equi-pak as a pad and feed a mineral supplement. I have seen little improvement. Is there anything I can do to help him? How long do I need to keep using the mineral supplement before I’ll know if it’s working? A: Pedal osteitis is an inflammatory condition of the coffin bone (also called the pedal bone, distal, or third phalanx, or P3) that results in demineralization of that particular bone. This condition can be classified as septic or non-septic, depending if there is a bacterial component. Non-septic pedal osteitis can be associated with chronic or severe sole bruising, such as what happens during repeated exercise on hard surfaces. More commonly, non-septic pedal osteitis occurs due to persistent corns, laminitis, or even conformational defects. 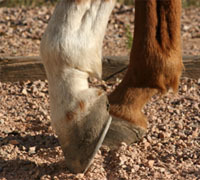 Septic pedal osteitis can occur as a secondary complication from a puncture wound in the hoof, deep cracks in the hoof wall, avulsion hoof injuries, and even subsolar abscesses, all of which can allow environmental pathogens into the hoof capsule to eventually infect the coffin bone itself. Pedal osteitis, regardless of the cause, results in lameness on the affected hoof. This lameness can range from relatively mild to severe, depending on the extent of damage to the hoof. This condition has a fairly classic appearance on radiographs (x-rays) and most cases are diagnosed this way. This condition occurs most commonly in the front feet. Although the overall goal for treating pedal osteitis is to eliminate the inflammation within the coffin bone, treatment regimens depend on if the condition is septic or non-septic. From your description, it appears as though your gelding has the non-septic type. Reducing the exposure of the sole to the concussive properties of the ground during healing is the obvious first step in treating this condition, which your veterinarian has addressed with use of a pad. Another shoeing option is a wide, egg-bar shoe with a solar surface that is deeply concave to keep your gelding’s sole completely off the ground. The toe of the shoe can also be squared off to increase breakover. Stall rest or avoiding exercise and turnout on rocky, hard surfaces should also be implemented. A course of non-steroidal anti-inflammatories such as phenylbutazone (bute) may also help reduce your horse’s lameness. Discuss with your veterinarian before starting your horse on any NSAID. If by chance your horse’s condition is septic in origin, treatment involves surgical removal of the infected tissue, by either debriding the tract, if it was caused by a puncture wound or subsolar abscess, or by removing the infected portion of the coffin bone. Simple placement on systemic antibiotics is not enough to eliminate such a deep-seated infection. Chronic cases of pedal osteitis tend to have an unfavorable prognosis. This is because of the cycle of inflammation and demineralization that is occurring within the coffin bone, causing it to become increasingly brittle and damaged. There are currently no studies confirming the benefit of oral mineral supplements on pedal osteitis; in order to make headway in this condition, the inflammation needs to be addressed by the above mentioned options of shoeing, rest, and NSAIDs. A last resort to pain control is a palmar digital neurectomy, as known as “nerving”. This surgical procedure cuts the nerve that supplies sensory information to the hoof, thereby eliminating the pain. This does not actually cure the cause of the condition, but rather just nullifies the symptom. Nerved horses should not be ridden. Talk over these other options with your veterinarian. If you end up altering your horse’s treatment protocol, give him at least a month to judge his responsiveness. Any improvement is a good sign. Cases may take months of management before the horse becomes sound again, depending on the cause. Sounds like something a Pete Ramey type proper trim and booting for pain relief would help with or cure.